Cheryl has practiced and taught Art since 1971, and Yoga since l980 to people of all ages across the South West. Her passion is teaching in a way that encourages her fellow practitioners of Art or Yoga to become completely embodied in their own unique and often quirky creative selves, and to have a LOT of fun doing that. "Cheryl Alexander Designs" has a whole new "Twist" !! 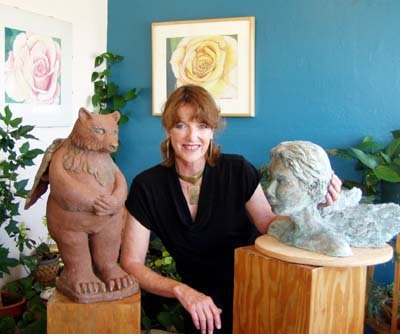 Cheryl Alexander Designs Sculpture...New "Twist", sculpture to honor friends who have passed into the Spirit World. Cheryl Alexander Designs Jewelry...New "Twist", Jewelry reflecting her newly learned metal patina skills. Cheryl Alexander Designs Yoga...New "Twist", yoga for persons with Multiple Sclerosis; Yoga that bridges Asana and Art; Yoga specifically focused on healing (in conjunction with the Health and Healing Consortium of San Antonio, Texas). Her work is sold in galleries in New Mexico and Arizona. View examples of her work at the following link: http://www.javadoggallery.com/pages/alexander.html. Cheryl with "Angel Bear" and "Katy with Wings"
Cheryl spent the years from 2004 through 2008 in beautiful, inspiring high desert mountain locations in New Mexico: from the quaint art village of Placitas, in the foothills northeast of Albuquerque to the even more remote and art-enriched village of Nogal, nestled between the Capitan and Sacramento Mountains of Lincoln County north of Ruidoso, NM. In each location Cheryl found amazing opportunities for community involvement, collaborative art, women's circles and spiritual grounding. In the summer of 2008 her wanderings led her back to her geographic origins...the Hill Country of Texas, in a rural area near San Antonio, Texas. From this sweet remote property on the seasonal Medina River Cheryl has been able to realize her longtime dream of having studios for both sculpture and jewelry, and a beautiful retreat-like setting in which to do yoga/meditation practice and hostess her wonderful family and friends.